This is a blend of the leaves of two native bushes from South Africa. Rooibos and Honey Bush grow only in the Cedar berg region of South Africa. 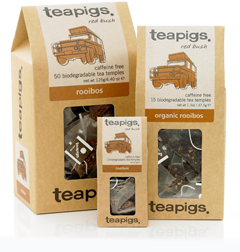 Rooibos (Afrikaans for red bush) and Honey Bush are harvested and processed in much the same way as tea. This organic blend is particularly high in antioxidants and nutrients. Compare the leaf in our tea temples to the dust in your regular tea bag; whole leaf is best. In need of some African sun. Who needs a safari break? A cup of this will give you that much-needed holiday feeling being crammed with goodies to rid you of toxins and calm your system.